Getting around in DC can often be a challenge, especially when you aren’t used to the amount of traffic we have here in the city. I always advise leaving your car at home or at the hotel and taking advantage of the other transportation options offered in the city. No car means less stress for parents and more fun for everyone. There are lots of different transportation options available in the city from tour buses, to bikes, taxi cabs and the very convenient metro. You can find more detailed information about all of these travel options by visiting our Getting Around page. As a family, you now have one more option – Uber Family. Not familiar with Uber? Uber is a car service which is popping up in more and more cities. You simply download the Uber app on your phone and a map will show you how many cars are available in your area and in mites how far away the car is. The cars are clean, the drivers are friendly and the best part is because you enter all of your credit card information into the app you can pay automatically – no cash needed and no tips accepted. Brilliant! Uber has now added a family option to their car service which means cars equipped with carseats can be requested for a $10 surcharge. Traveling with kids just got even easier. Thank you Uber! 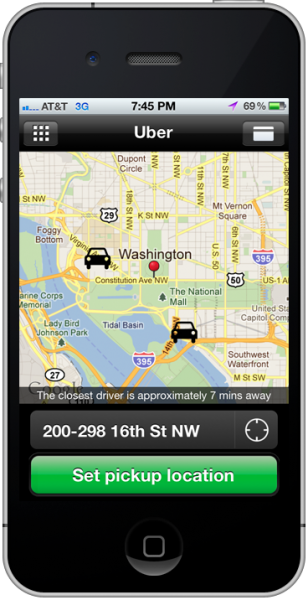 For more information on Uber and Uber family in DC click here.